It was just another day’s work for Santiago, 65, who started playing guitar for money when he was no longer able to work in the construction industry, where he toiled for decades. He likes his current gig, he said, but it’s also the only way he can make a living these days. On a good day, he said, he’ll collect about 100 pesos. That’s one reason why, like the rest of his fellow Mexicans, Santiago is now paying closer attention to the field of candidates vying to become Mexico’s next president, who will be chosen July 1. Santiago said he’s more concerned about the country’s economy than security, although the latter is a close second. He's pulling for former Mexico City Mayor Andrés Manuel López Obrador, or AMLO, as he’s known in this country. A poll conducted last month showed the outspoken populist and candidate for the National Regeneration Movement, or MORENA, with an 11-point lead over the Institutional Revolutionary Party, or PRI’s, Jose Antonio Meade. President Enrique Peña Nieto, also a PRI member, cannot run again because of term limits. Some business leaders in Mexico, Texas and elsewhere in the United States are nervous about what a potential victory by López Obrador could mean for international trade, the bread and butter for several border economies. Texas is Mexico's No. 1 trade partner. 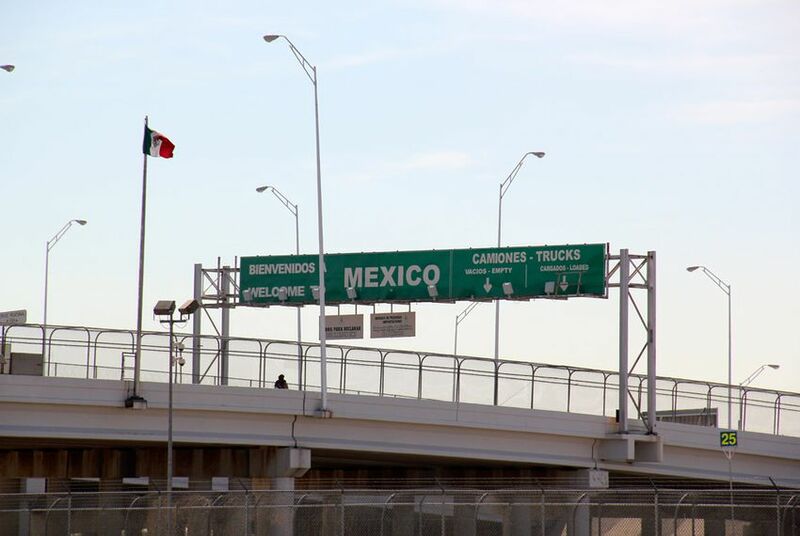 From January to November of 2017, the Laredo and El Paso customs districts saw $270.2 billion and $85.5 billion in two-way trade with Mexico, respectively, according to WorldCity, a Florida-based economics think tank that uses U.S. Census data to track trade patterns. “He has tapped into a growing nationalist sentiment in Mexico, perhaps due to President [Donald] Trump’s rhetoric [about Mexico],” said Jon Barela, the CEO of the Borderplex Alliance, a nonprofit focused on promoting business and economic development in Ciudad Juárez, El Paso and New Mexico. In September, Barela compared López Obrador to former Venezuelan dictator Hugo Chávez, a socialist and American adversary who was highly critical of U.S. economic and foreign policies. Obrador has initially said the North American Free Trade Agreement is a bad deal for Mexico and called for the delay of talks to rework the trade pact until after the Mexican elections. When coupled with the anxiety that Trump’s view of NAFTA has caused some Texans, the Mexican elections have sounded alarm bells for border industries who have thrived since the pact's inception in the early 1990s. Barela said he was encouraged by recent statements the front-runner has made on NAFTA, indicating he’s softening his stance and open to a dialogue on the trade pact. According to his campaign platform, López Obrador acknowledged that NAFTA was important to the Mexican economy and “a demonstrated useful instrument” Politico reported. But O’Neil said that might have more to do with messaging and a more sophisticated campaign style than when López Obrador ran for the presidency in 2006 and 2012. Meanwhile, Meade, who was polling at about 20 percent, is considered the candidate that would keep Mexico’s current economic policies largely unchanged. That’s why O'Neil thinks Texas business and political leaders might pull for him or Ricardo Anaya, a former National Action Party, or PAN, leader who has aligned with the center-left Party of the Democratic Revolution, or PRD. Anaya is also supportive of Mexico’s current institutions and was polling at 19 percent. Two other major candidates — Margarita Zavala, the wife of former President Felipe Calderón, and Nuevo Leon Governor Jaime “El Bronco” Rodríguez — polled at 10 and 2 percent, respectively. “I think the challenge Meade has is that PRI legacy, and it’s a legacy of increasing violence, it’s a legacy of high-profile corruption,” O'Neil said. Meade, a former economic and foreign affairs minister, is a familiar name in Texas political circles. In 2015, he visited Austin and met with Gov. Greg Abbott, where the two talked about several issues, including security, trade and infrastructure. O’Neil said Meade could have momentum because he isn’t an elected official. But as the PRI’s current choice, he must also push back against that party’s legacy of corruption and ineffectiveness in combating violence, she added. For Santiago, the street musician, the violence and the PRI’s inability to effect change on that issue is a reason he’s aligning himself with the populist candidate. “It’s gotten better, but not by a lot,” he said. “It’s been a disaster” overall. Once known as the deadliest city in the world, Ciudad Juárez has enjoyed some relative calm since a cartel war was responsible for the deaths of more than 10,000 people from 2008 to 2011. But 2017 was the deadliest year since 2012, with more than 770 homicides, and 25 people were murdered in just two days there last week. That failure to sustain peace in the country will ultimately be part of current President Enrique Peña Nieto’s legacy, said Vanda Felbab-Brown, a a senior fellow in the Center for 21st Century Security and Intelligence in the Foreign Policy program at Brookings Institute. And that could sink that party’s chance at re-election. Though El Paso remained one of the safest cities in the country during the mayhem across the Rio Grande, it didn’t stop people who didn’t know any better from assuming the violence was spilling over into Texas, Barela said. He’s always worried about what a repeat scenario could mean for investment in Texas. O’Neil said that with so many candidates, the eventual winner could only need to secure about 30 percent of the vote, as only a plurality is needed to win the office. “That isn’t much of a mandate,” she said.